Does your business serve a specialized customer base? Wondering how to reach specific niche audiences with Facebook ads? To explore a strategy for retargeting specialized audiences using Google ads in combination with Facebook ads, I interview Shane Sams. In this episode, I interview Shane Sams, the co-host of the Flipped Lifestyle podcast, a show focused on helping families make money online. He describes himself as a normal guy from Kentucky who loves helping others. He’s also the founder of the Flip Your Life Community. 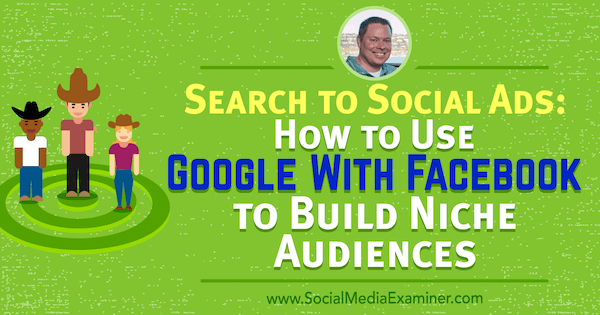 Shane explains how to use website traffic generated by Google ads to retarget Facebook users. You’ll discover how highly focused keywords help manage your marketing costs. 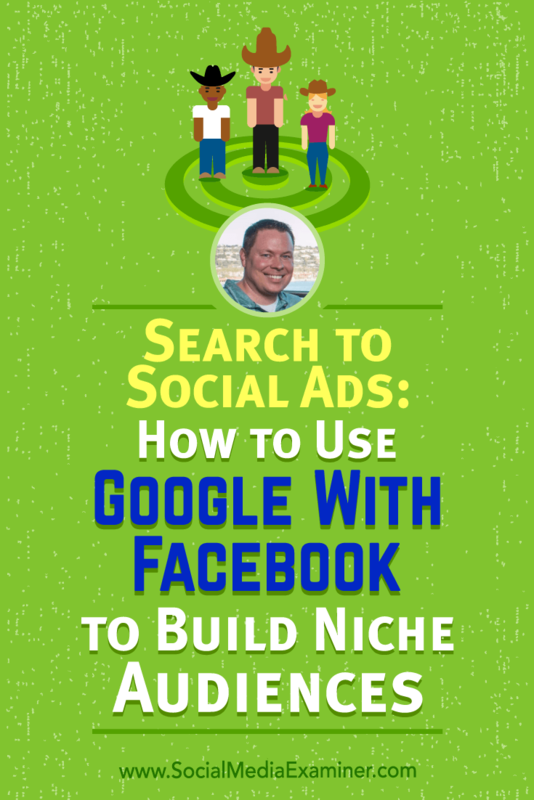 Search to Social Ads: How to Use Google With Facebook to Build Niche Audiences featuring insights from Shane Sams on the Social Media Marketing Podcast. Shane and his wife Jocelyn met at the University of Kentucky. After graduation, Jocelyn initially worked a corporate job and Shane coached football. They then decided to become schoolteachers, which they did for about 10 years. Shane taught social studies and continued to coach, while Jocelyn was an elementary school librarian. After some bad experiences at work, Shane realized he had traded control of his life for job security. He started looking for other things to do because he knew there had to be a better way. This was in 2012. One day, as Shane and his wife were driving around town, Shane said, “I wonder if I can get 100 people to send me $50.” She asked what he was talking about and Shane said that out of the 7 billion people on the planet, surely 100 would give him $50. If they all did that in a month, it would be $5,000, and for 12 months in a row, it would be $60,000. If they could do that every month, they could quit teaching. Shane didn’t know how he was going to make this money but he was determined to figure it out. He began seeking information about business. One day while mowing the grass, Shane decided to look up business podcasts. An image of a guy looking at the podcast art with his eyeballs caught Shane’s attention. It was Smart Passive Income with Pat Flynn. After listening to Pat Flynn’s Smart Passive Income podcast, Shane knew what he had to do. In the podcast, Pat talked about how he sold a study guide and would email it to people. Shane decided he and Jocelyn could sell PDFs of information. After trying different things online, they were finally able to figure it out. They sold lesson plans to teachers and football playbooks to coaches. A year later, Shane and Jocelyn replaced their income. As soon as they quit their jobs (which they did on September 27, 2013), people started asking questions. For example, Lindsay, a friend of Jocelyn’s, quit her job to be a stay-at-home mom and wanted advice on making money online. They helped Lindsay create digital products and she made $1,000 on the Internet in a month. This money enabled Lindsay to be at home with her daughter every day. After Shane and Jocelyn realized their experience and knowledge could change the lives of others, they started Flipped Lifestyle. It has helped a lot of people. Shane and Jocelyn started Flipped Lifestyle to help other families take a similar business path. People ask why it’s called Flipped Lifestyle. Shane explains that everybody flipped out after Jocelyn and he left their jobs, where they had tenure and insurance. Shane recalls how his mom cornered him and said, “Shane Sams, you have babies. You have lost your mind. You have flipped out. And I do not approve of this decision.” Hence, Flipped Lifestyle. Listen to the show to hear Shane recall how much sharing online business skills meant to his friends. 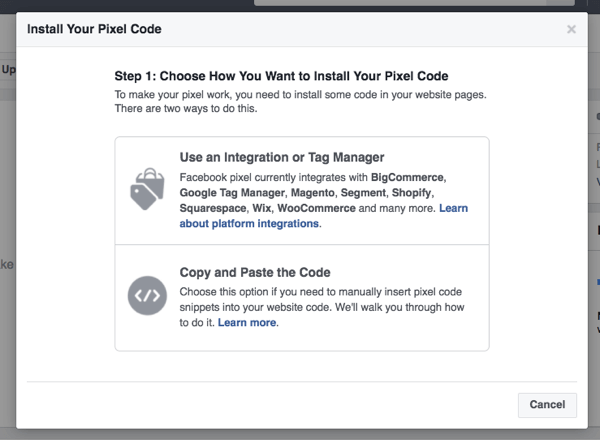 Why Combine Google Ads With Facebook? Early on, Shane and Jocelyn discovered a lot of the marketing advice available online didn’t work for educators like elementary school librarians, history teachers, and football coaches. Marketers with a business focus can target the Facebook page of Tim Ferriss, Gary Vaynerchuk, or somebody with a million followers, because their fans are all entrepreneurs. However, when you sell something like Civil War battlefield crossword puzzles, it’s more difficult to find interested people on Facebook because that audience doesn’t typically like or follow a page that reflects that specific interest. You may be able to target and find teachers; however, their specialty could be algebra, and math teachers have no interest in librarians’ material. Targeting teachers doesn’t necessarily mean you’re reaching the right audience of teachers. To begin finding their customers, Shane and Jocelyn looked instead at search. They realized their potential customers were searching Google for materials. Through Google, they could find customers looking for their products, pixel those potential customers, and then follow up with Facebook ads. The approach could be powerful (and inexpensive). The core of all marketing is follow-up. You don’t show someone something only once. That’s why you get 100 Pepsi commercials during every football game. Pepsi wants to ingrain itself in your brain. Then when you really want a soft drink, you’ll buy a Pepsi. Shane and Jocelyn are doing the same thing. They’re getting in front of people where they are looking for their solution (on Google), introducing themselves, and following up. Listen to the show to hear Shane’s car salesman analogy. Start where your customers are searching for solutions to their problem. Shane and Jocelyn use Google, but your customers may be elsewhere. For instance, if you sell guitar lesson plans, you may want to buy ads on a forum for guitar players. In Google, set up an ad based on your target keywords. The plan is to drive traffic to a page where you give something away. In your ad, offer something to solve people’s immediate search problem and emphasize that the item is free. On the giveaway page, eliminate any friction for getting the promised item. Users who grab Shane’s freebie will be shown an ad that leads them to something else. They’ll need to opt in to receive the next piece of content. For example, people search for the term “Civil War battle site crossword puzzles” 4,000 times every August. Shane’s ad targets those keywords and offers a free crossword. The clicks cost only $0.02 because nobody else is targeting those keywords. With your giveaway, you want your potential customer to feel really happy about what they found. This first step isn’t just exposure; it’s a handshake. It’s “Hi, I’m Shane. I sell history lesson plans.” Also, those who grab the free item will get pixeled. After you pixel your potential customers, follow up with a Facebook ad that tries to get them to opt in. In Shane’s example, people will get a Facebook ad that says something like, “You just finished the Civil War. You’re going to teach the Spanish-American War next. Here’s a lesson plan. Click here.” To get the next item, the user must opt in. After that, they see an offer to buy the entire year of lesson plans for a certain amount of money each month. Shane says the retargeting pixel converts more customers than their email list does. Emails get old over time. You may have a 10,000-person email list, but 2,000 of them are from 2012 or they don’t get delivered to the inbox because of email filters. Facebook retargeting converts more customers for Shane than email does. On Facebook however, when you retarget the 30-, 90-, or 180-day people, they’ll see your ad and remember that you helped them by giving them an answer to their search. Plus, it will be easier to convince them that you have solutions going forward. Listen to the show to hear why Shane calls his strategy search-to-social marketing. The power is in long-tail keywords. You need to be very specific. Use specific long-tail keywords in your marketing. Dig down deep into the keyword research tools to find terms that your avatars (ideal customers) are definitely looking for. Then use those keywords to target your ads. These long-tail keywords cost only $0.02 and $0.03 because there’s no competition. Also, build keyword coalitions. It’s not about finding a keyword with 20,000 searches a month. Find 40 keywords with 500 searches a month. Target those to find the really cheap traffic that’s valuable to you. You don’t need to create a special offer for every keyword phrase. Instead, think in terms of categories. 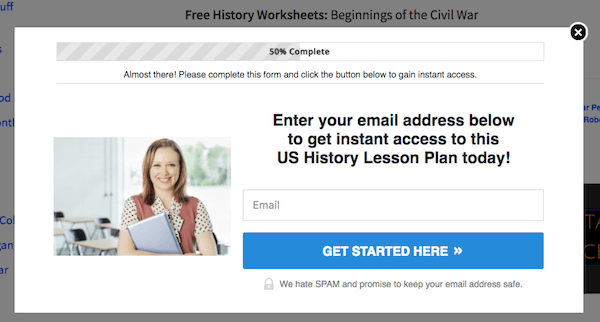 For example, if Shane wants to reach history teachers who are covering the Civil War, he uses a bunch of related terms and sends traffic for all of those terms to a Civil War lesson plan. Shane may give away two weeks of lesson plans so his potential customers have everything they need to succeed. Then, in two weeks, when they see the Facebook ad related to what they’re teaching next, they’re more likely to take him up on that offer. Although plenty of tools can help you find keyword phrases, Shane uses the Keyword Planner in Google AdWords. It’s intuitive and you can see all of the information you need, such as average monthly searches, trends, and competition. Keyword Planner gives Shane a good idea of what he’s going to pay for ads and he’s going to build his ads in Keyword Planner anyway. Plus it’s free. I ask how much money marketers can expect to spend, and Shane says the ad budget depends on your niche. For some, cheap might be $1; for others, it could be $0.02. Regardless, you need to spend substantial money. You want to try to get a thousand people a day, a month, or whatever. You can’t spend a dollar a day and hope to succeed. You have to invest. Shane says he starts all of their ads at $5 to $10 a day to collect data, learn what’s working, and make adjustments if necessary. Shane starts ads with a low budget to gather performance data. Listen to the show to hear what people talk about instead of long-tail keywords. The Facebook ads should be designed to give your avatar the next step in whatever product you’re selling in exchange for an email address. So you need to know their calendar. For example, after teachers cover the Civil War, they’ll likely teach the Spanish-American War or World War I. They’ll see an ad that says something like, “You just had a great time with our Civil War lesson. Click here to get a free World War I lesson plan.” They need to opt in to get it. Then Shane can let his internal email autoresponder sell them his yearlong program. The content flow will depend on the niche. An entrepreneur may send out a goal-setting guide in January and follow up with a sales funnel course to help readers reach their business goals. Shane will send his football coaches a free game plan in August. At the end of the year (and football season) the coach will take their players to the weight room. So in January, Shane’s going to sell him a weightlifting manual. It’s important to arrange your marketing around your customer’s calendar. Shane sends ads immediately after he gets people pixeled. On the lesson plan sites, he starts a new ad each month based on what he thinks is the next step in the educator’s calendar. They use the 180-day pixel to get in front of everybody who has been to the site over the longest amount of time. I ask Shane how he tracks traffic from Google to Facebook. Shane says there’s a gap between the number of people who visit a page and the number who are pixeled. However, after the marketing moves over to Facebook, all of the analytics are there. To make up for the gap, Shane uses a dedicated page for his Google ad, which makes closing that gap a little easier. Expect an opt-in rate of about 10% to 15% after people join your email list. Listen to the show to hear Shane explain why getting the keywords right keeps your Facebook marketing costs low. After people are on Shane’s email list, they’ve already shown significant interest in his products by downloading his giveaway and opting to receive his second free item. With that in mind, Shane pitches on the second email, even though some experts say to draw out your email marketing. I ask if Shane does all the selling via email or also through Facebook. Shane says they’ll do Facebook ads, but it needs to be tied to something on the calendar like a Black Friday sale. 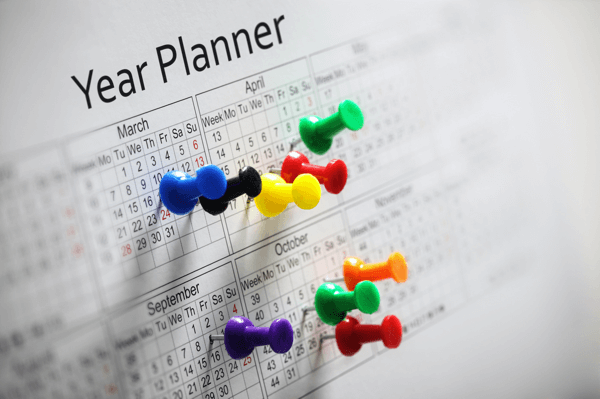 Coordinate your Facebook ads with calendar dates that are relevant to your customer. For Jocelyn’s elementary school librarians site, they might do a Facebook ad for Dr. Seuss’s birthday week because that’s a huge event every year. The ad needs to be in line with their audience’s normal flow of life so it feels like a bonus. Although everything in Shane’s business is “set it and forget it,” he occasionally adds new products to his offerings. For example, for an upcoming librarian conference, he might create an ad that says, “Are you prepared for this conference? Here’s a new thing we offer,” which is a conference survival pack. Shane uses ads like these to get in people’s minds in a new way and keep building relationships. It’s like bumping into people out in public. You’re never going to have 100% of the market, so why not keep selling to the market? Listen to the show to hear Shane discuss the size of his email list. Use TextExpander to insert boilerplate content, create abbreviations for frequently used words, and more. For example, say you save SME as a snippet in TextExpander. Every time you type SME, TextExpander changes the snippet to Social Media Examiner. Save time by creating shortcuts through the TextExpander app. You can sync the snippets across Windows, Mac, and iOS devices, so you can access your snippets from almost anywhere. On iOS, TextExpander adds a new keyboard for typing your snippets. 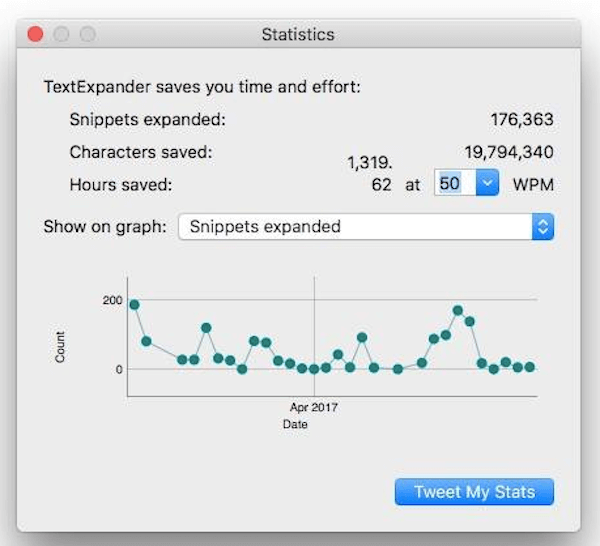 For teams and organizations, TextExpander offers additional tools for sharing snippets, which can help your business deliver consistent and up-to-date information. For instance, if your company is selling tickets to an event and you want everyone to use the same promo language, put one person in charge of creating and changing the text in TextExpander. Then anytime somebody types the designated shortcut, TextExpander inserts the correct language. The entire team has the same up-to-date boilerplate information. Listen to the show to learn more and let us know how TextExpander works for you. Learn more about Shane on FlippedLifestyle.com. Join the Flip Your Life Community. Listen to the Flipped Lifestyle podcast on iTunes. Follow @FlippedLS on Instagram and Twitter. Get Shane’s free course: flippedlifestyle.com/sme. 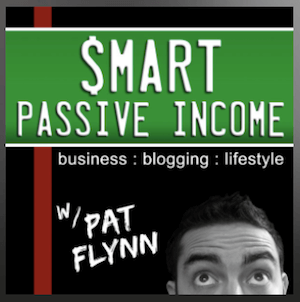 Listen to Pat Flynn’s Smart Passive Income podcast. Explore the Facebook pages of Tim Ferriss and Gary Vaynerchuk. Take a look at the Keyword Planner in Google AdWords. Check out Shane’s offers at USHistoryTeachers.com and Elementary Librarian. Watch our weekly Social Media Marketing Talk Show on Fridays at 10 AM Pacific on Crowdcast or tune in on Facebook Live. Learn more about Social Media Marketing World 2018. Download the 2017 Social Media Marketing Industry Report. Help Us Spread the Word! Please let your Twitter followers know about this podcast. Simply click here now to post a tweet. What do you think? What are your thoughts on search-to-social ads? Please leave your comments below.